Dynamics CRM includes some data types not available for custom fields. Because these field types act slightly different from the standard ones, it's necessary to pay attention during development. Owner is a data type used for the built-in OnwerId field. This field is present only when an entity has the Ownership set to User or Team, it's not present if the entity's ownership is Organization. It can hold one user or one team record. Customer data type is used when a field can hold one account or one contact record. Contact and Lead entities use this data type (ParentCustomerId and CustomerId respectively). Party List (also known as Activity Party) is the most complex data type, it can hold more than one record at the same time and the possible entities are defined by the ParticipationTypeMask attribute. Server-side we have some differences, although Owner and Customer data types are EntityReference, Party List type is an ActivityParty. 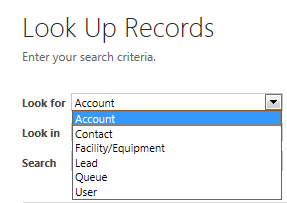 Is there any way in CRM 2015 to limit a Customer lookup to allow only Account record types?